Loaves and Fishes pewter pendants are artistic and fashionable expressions of faith- unique to the marketplace. Each design is a creative interpretation of a Bible verse or story as expressed by the artist. Designs are gift packaged and include a story card relaying the message of the piece. 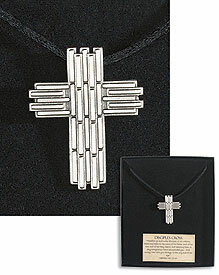 Gift Boxed -- Pewter -- 1.5" H , 20" L Cord. This is a special order item. Allow 2 weeks for delivery.